places we have visited. Thanks to Int’l Home Exchange! Okay, I’m hoping that by now you no longer think it’s my head that needs to be examined! Really, if you’ve made it to this week, I do hope you are becoming more comfortable with the idea of international home exchange. You need to be comfortable with the idea, before you are ready to make it a reality. I want you to make it a reality; and I won’t stop until you are ready to do that. Maybe reading this will help. For some reason, maybe it was just my intense desire to travel, but I had very little problem entertaining the idea and jumping right in and giving international home exchange a try. If you think that I’m fearless or still think I’m crazy, you are welcome to think that, but you would be wrong! I think trying international home exchange was the sanest thing I ever did, but not brave. You don’t have to be brave to home exchange. I have lots of fears, just like everybody else; just not about international home exchange. Given what I’m about to share with you, you may wonder how it is possible that I have been so comfortable with international home exchange. I’m not any more trusting than the next person; in fact, I’ll go as far as to say that I am often more negative and vocal about what’s lacking in human behavior in today’s society than most people. I lock the doors to my house at night; I don’t go walking in strange neighborhoods alone after dark; I barely ever let my kids out of my sight; and I always carry a cross body pocketbook so I can keep it close in crowded places. That is just common sense to me. Does that sound like a foolishly trusting person to you? Aside from my fears, I have other things that you might think would deter me from home exchange. Just like most of you, I love and appreciate my home and my possessions; not because they are so valuable, but because they are so meaningful to me personally. I don’t fill my home with extravagantly expensive things, but the things I fill it with, I really appreciate; I’ll go as far as to say I treasure them. I would be extremely upset to have someone steal or damage the things I love. Yet, I still have no qualms about home exchange. I am also very easily “grossed out” by the thought of staying anywhere that might not be clean enough for my taste. I wouldn’t go as far as to say I am fanatic about cleanliness, or that I keep my home immaculate at all times (because that would be a lie); but, living in someone else’s mess, would really disturb me. I can’t stay anywhere that is not clean. Yet, I still have no qualms about home exchange. Furthermore, I don’t love the idea of sleeping in someone else’s bed or having them sleep in mine; but I remind myself that when you sleep in a hotel, hundreds of people have slept in that same bed, all strangers! I also remind myself that I only select very clean homes for my exchanges. Yet, I still have no qualms about home exchange. So, how is it that I have no qualms about home exchange? Well, first of all, it’s because I am realistic; and I know that home exchange is not a one sided deal. Your home exchange partner has just as much to gain or lose as you do. You are giving up your home to them, and they are giving up their home to you. You are both accountable to the other to respect each other’s property. It’s not all about you trusting them. You have to gain their trust as well. I also know that it is simply illogical for a home exchange partner to come to my home, from another country, to hurt me by stealing or wreaking my things. It just does not make sense. The fact is, I’ve never heard of it happening to anyone. Home Exchange has been around for 50+ years; there is a reason for that. It’s great and there is really no risk involved. My first home exchange partner, with the vacation home in Spain, could not complete her part of our exchange because of complications with her early pregnancy, yet she allowed us to use her vacation home as arranged. She even lost rental income on it for 10 days. I was told by her cleaning woman that the house rented for $2,000 per week. She lost about $3,000 in rental income. While making arrangements with another home exchange partner, who lived just outside of Paris, I mentioned that we would be purchasing TGV train tickets to get from southern France to his home in Paris. I asked him if the price I found on-line was good. He told me not to purchase the tickets, because he could get them cheaper. He insisted on purchasing the tickets for us and mailing them to us; and he did. He saved us almost $200 and he laid out over $200 of his own money, knowing he would not get it back for several months, not until we arrived in France. He trusted that we would make good on the fare. Of course, we did. My most recent home exchange partner was truly generous. She gave us not one, but two of her cars to use. She insisted her brand new smaller Mercedes would be easier for us to park and cheaper to refuel than the new model over-sized Land Rover she also left us. We never touched the new Mercedes, but we really appreciated her generosity. I don’t know for sure, but I think these examples should be meaningful. They are to me. I have since gone ahead, without fear, and exchanged my home five times in the past five years. We have not had a single problem. The reason that I now advocate for home exchange is because I really believe in it. I’m actually head over heels in love with it! It is so wonderful to be able to trust so freely, and to travel so magnificently. This entry was posted in Uncategorized and tagged home exchange, international home exchange, international travel. Bookmark the permalink. 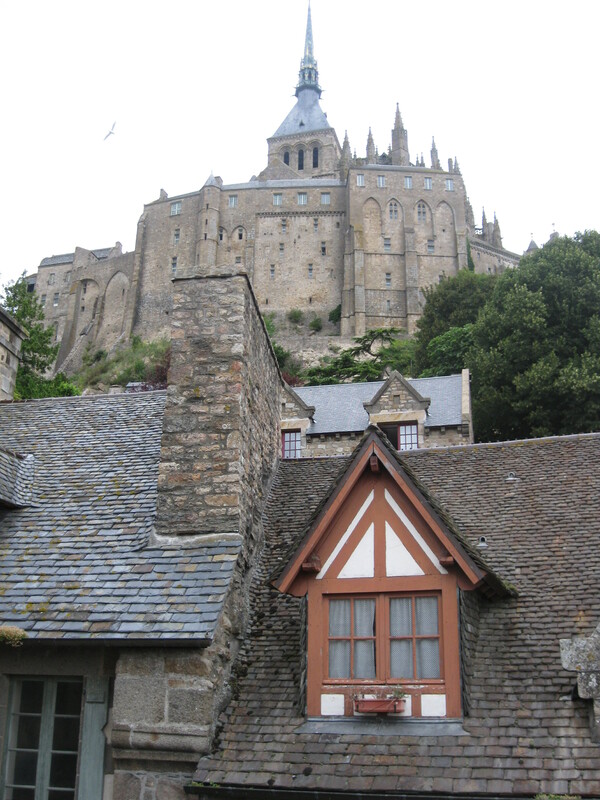 I’ll always remember our first view of the Mont St. Michel from the roadway leading up to it. It looked so intriguing with all of the birds flying around the moat. I was thinking the same thing! I remember that too; when we approached, the birds were flying all around the tiny island and it looked so ominous and exciting. I’d loved it! That is the photo I wanted to include in the post, but could not find it! I have to go back to take that photo another time. I wasn’t satisfied by the brief time we spent there.